2018 marks the centenary of the 1918 Armistice that ended the First World War. As part of the commemorations the museum wishes to honour the service of the police officers in the Greater Manchester area who volunteered for the armed forces, and the special constables who took their place. After Britain’s entry into the First World War on the 4th August 1914, many former servicemen, now in the police force, were asked to rejoin their former regiments. As Britain did not implement a conscripted army for the initial years of the war, the British army was reliant on volunteers. Here is just a small sample of some of the Officers who served in the First World War. Christopher Barrett served in the army from 1907 to January 1914. He joined the police in July 1914 only to be called to service in August 1914. He returned to the Royal Horse Artillery and served for the duration of the War. He demobilised after the Armistice and was reappointed in the police in 1919. His character is recorded as Exemplary upon discharge from the Army and he resigned from the Salford Police Force on 4th October 1933 at 45 years old. James Blackford served in the 2nd Manchester Regiment from May 1902 to May 1904 and discharged with very good service. He then joined the police force in 1907 until the outbreak of war in 1914. He was then sent to the war office as an assistant instructor, and later served as an enlisted man for the rest of the conflict. After he was demobilised in December 1918, he rejoined the police force, and served until 1932, when he retired at the age of 48. Thomas Box joined the Police Force on the 15th September 1913 after serving in the Army from 11/12/1907 to 24/08/1911. 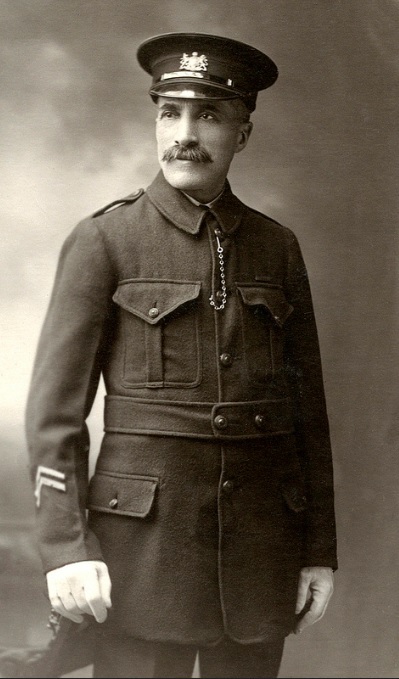 He was called upon to rejoin the 2nd Grenadier Guards on the 5th August 1914 and served for the duration of the war. He was demobilised from the army and was appointed constable on 30th December 1918. He left the Force on 9th June 1926 aged 35. Whilst many other officers also served in the war, the work of the Special Constables is also to be commended. After the Special Constables Act of 1914, Specials could be appointed for an indefinite amount of time to ensure peace during this national emergency. Specials were organised into a company of 50, led by a leader who were assigned to one of twenty districts available at the time. Many specials were not given uniforms and used only an armband and police badge to denote their station. By 1916 however, a full uniform had been created for on duty officers, as well as an off duty lapel badge and an “On War Duty” badge. These were to discourage and prevent the presentation of the white feather for cowardice, given by a misguided public to men they saw as unpatriotic. After the Armistice in 1918, the Specials were mostly disbanded, and serving members were given a decorated truncheon with their name and the coat of arms of their place of service.